$50 - $65 Flower Cubes If you didn't think that roses could look more beautiful, think again. Our roses are carefully and uniquely arranged in the glass cube vases and we ensure color of the vase enhances the beauty of the roses. We take pride in all our flower arrangements and we love arranging eclectic mixed flower cubes for our customers. Treat yourself and purchase one our elegant rose flower cubes and watch your home transform. Arranging Spring Flowers: Spring is the season of fresh flowers, when one thinks of spring, the first thing that comes to mind is a nice bouquet of fresh flowers, in the beautiful hues of spring. 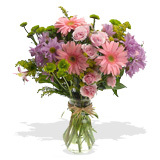 Spring is the season that has many popular flower giving occasions as Easter, Mothers day, Graduation all come in the time of this fresh season, allowing us to take advantage of the beautiful spring flowers. Tulips are the most popular spring flower of choice, among our customers. You may choose a bouquet of mixed pastel tulips or perhaps you might visit our spring flower section that has a great selection of mixed spring flower bouquets, created to compliment any home décor.